I’m pretty annoyed with myself right now. I’ve had the past 13 hours to do whatever I want. I’ve squandered this time, not just today but it’s happening a lot lately. Mostly doing pointless crap on the internet. I’ve watched a grand total of two movies in that 13 hours. Granted, I also caught up with last night’s episodes of “Community” and “Parks and Recreation” but still, I could have watched a lot more. I wouldn’t be so disgusted with myself if I had done something productive or rewarding with that time instead, but no, I merely wasted it. Tomorrow, I swear I’m watching at least four movies unless I have a damn good excuse (like mowing the lawn, which is looking pretty shabby). So now it’s 1:30 in the morning and I’m in no mood to write a review. So I’m gonna cheat. What follows is a not especially good summation of the film and my feelings on it that I wrote for a “Movie of the Month” deal on an internet forum five years ago. There’s not much substance to it, but it’ll do. I’ll add some brief thoughts at the end. Womanizing, chain-smoking, pill-popping Joe Gideon (Roy Scheider) is trying to produce a Broadway musical, edit his latest film, and not die. The effort he puts into the first two is considerably greater than the effort he puts into the last. He tries to do his best by his long-suffering girlfriend (Anne Reinking), ex-wife (Leland Palmer) and young daughter (Erzsebet Foldi, in her only screen role) but let’s just say his best is not very good. He reflects on his life and his shortcomings with an angel of Death (Jessica Lange). All That Jazz is blatantly autobiographical, and is notable for being both brutally self-deprecating and incredibly egotistical. Fosse (through his surrogate Gideon) asks us to accept his many flaws and still love him anyway. And that’s not hard to do; Scheider’s performance exudes charm and talent and inner conflict. No one is more disappointed in Joe Gideon than Joe Gideon. It’s one of my all-time favorite films. The musical sequences are spectacular, especially the bookends: the audition montage of “On Broadway” that opens the film, and the stunning Scheider/Vereen duet of “Bye Bye Love” that closes it. I rank these two scenes among the finest in American cinema, brilliantly dynamic with energetic editing. There’s a lot of great numbers in between as well, although I will say that even after several viewings, the “Air-otica” scene still bugs me. Musicals can get by with just having great song & dance numbers, but All That Jazz is much more. The drama of Gideon’s life, his creative drive, his shaky relationships and his failing health would be plenty interesting enough on its own. It’s the combination of the dazzling musical bits, the fascinating character, and the expert craftsmanship that makes this a truly great film. Won Academy Awards in Art Direction, Costume Design, Editing, and Music. It was also nominated for Best Actor, Best Cinematography, Best Director, Best Screenplay and Best Picture. Won the Palme d’Or at Cannes, and Best Musical/Comedy at the Golden Globes. This entry was posted on April 20, 2013 at 1:57 am	and is filed under Movie Reviews. You can follow any responses to this entry through the RSS 2.0 feed. You can leave a response, or trackback from your own site. I actually watched this movie based off of that Movie of the Month thread, and I was so, so glad I did. It’s not the kind of thing I would have ever sought out on my own, but once I saw it, I was absolutely floored. 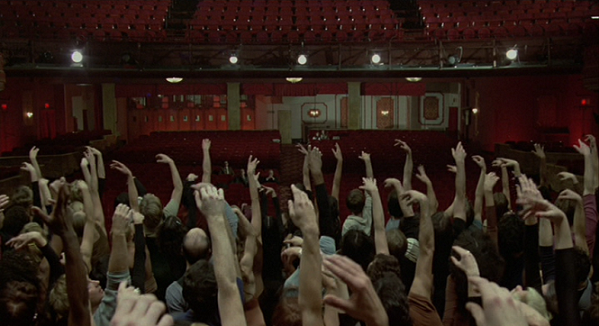 It also made me much, much more interested in seeing other Fosse movies, and so far, I’ve loved the ones I’ve seen. It’s one of my favorite things to hear: someone saw I movie I recommended and loved it. I still need to see STAR 80 and LIZA WITH A Z, but I’ve liked everything else by Fosse. None as much as ALL THAT JAZZ, though.